When Technology Outruns Reason, Pt. 2 - Dennis McCarty Nuclear Power is an example of human creativity, and the demonic side of that creativity. I was driving across southern Idaho’s Snake River Plain, which is the bleak bosom of American Nuclear Research. More than 50 experimental nuclear facilities have been built there over the last two generations. My destination this day was the EBR-1 National Historic Landmark. In our cynical age we lost track of the enthusiasm people felt toward nuclear energy in the decades right after the Second World War. The Manhattan Project and Oak Ridge, Tennessee, linger in history. But there was way more than that going on. Our government had spotted nuclear research sites across the country, from Chicago to Tennessee to Kentucky, including here. In those halcyon years the constructive potential of nuclear energy was seen as unlimited and without drawback. 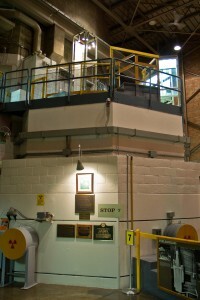 Radioactive uranium, however, was thought to be rare. No one had yet dreamed of uranium deposits we were later to find, or the technology to exploit them. Therefore the breeder reactor, to maximize the small amount of nuclear fuel we thought was available. Surround a U-235 core with a blanket of non-radioactive U-238. The fission process in the core releases surplus atomic particles. They provoke a secondary reaction in the surrounding material, producing both usable and unusable radioactive byproducts. Sadly, we were using breeder reactors to make bombs, long before we tried building one for peaceful purposes. EBR-1 was the first. Physicists in 1951 considered it a raging success. They conducted a variety of experiments on fuel, cooling agents, procedures, and reactor dynamics, before shutting it down in 1968. Now it’s a museum. In my days as an electrician, I had worked on several power plants, both nuclear and coal-fired. Nuclear power plants are much smaller and more compact. But this one was just, plain tiny. It looked to me like a cross between a high school and a prison, flanked by fencing, guard shack, office annex, and cooling structures. The shady interior even felt like walking into the basement of that high school. Except for the banks of control panels, museum-style information displays, and the angular containment structure in the middle. People quietly read the display boards, or mused over the bulky, postwar-era electronics. A few whispered to each other. I think they were experiencing the same mixed emotions I was, awe mitigated by time-warp. Because nuclear energy is so controversial in our day, the utopian dream it represented in the 1950’s, seems strange. Not to mention how proud we were of our scientists and technicians, leading the world in this research. It was the cutting edge of human ingenuity, and the U.S.A. owned it. After two years of construction, installation, and tweaking, engineers succeeded in illuminating four 200-watt light bulbs. A docent explained to us, there wasn’t much celebration at the time. The scientists were all so worn out from months of hard work, they just went home thinking, Thank God that’s done. A display photograph showed the beaming crew, proudly posing with that string of bare, incandescent bulbs. I walked past EBR-1’s generator. Again, if commercial nuclear power stations are small compared to coal-fired ones, this was infinitesimal. This generator was smaller than gas fueled, emergency generators I’ve seen in commercial buildings. It was a success, though, including the “breeding” of nuclear fuel. They learned a lot and within a few years spawned another experimental reactor, BORAX-III. They hooked that one up to the electrical grid in the tiny town of Arco, Idaho, a few miles away. In 1955, Arco became the first town powered by nuclear-generated electricity. There’s still a commemorative “Atoms for Peace” marker along U.S. 20, driving west out of Arco. Looking back at that photo, or watching interviews taped 50 years later, the scientists’ excitement, sense of teamwork, and joy of success are palpable. There were devoted professionals at the cutting edge of human creativity. It’s a funny feeling to look back after decades of fine print and debate on nuclear power. Now we see how creativity can have what theologians might call a “demonic” side. There were unpleasant surprises, even then. Testing coolant procedures in 1955, trying to understand unexpected heat surges, they accidentally overheated BORAX-III’s reactor and melted part of the core. The core was only the size of a household water heater, contained within a steel-and-concrete housing, so the damage was minimal. No one got hurt, nothing got destroyed, and the supervisor noted that a great deal was learned. Another experiment down the road, Stationary, Low-Power Reactor 1, wasn’t as lucky. SL-1, for short, was a small prototype reactor for actual power generation. The plan was to mass produce these things, then ship them, pre-fab, to remote locations. SL-1 was water cooled because that was thought safest, even though more sophisticated coolants were available. They started it up in 1958, and it ran fine for a couple of years. Then in January, 1960, after a routine maintenance shutdown, three workers were preparing it or re-start. It seems incredible today, but part of that process was to manually re-attach the radioactive control rods to the automatic lifting system. What’s more, looking back from our time, the procedure for doing that–well, breathtakingly “mickey-mouse” is the only term that springs to my mind. Each control rod had to be hand lifted, using a clumsy vertical handle, and then C-clamped into place, while the automated lifting linkage was bolted up. C-clamped? A nuclear reactor? Are you kidding me? All this while the technicians were standing on top of the reactor housing itself. It certainly seems as though they were asking for it. And they got it. For reasons we’ll never know, the workers lifted the assembly too far. There’s still argument on how and why. Too little evidence remained, to be sure. There seems to be no likely explanation, which has to mean that something unlikely happened. There’s the demonic side of nuclear power again. How do you prepare for what’s unlikely? Whatever the reason, instead of lifting the control rod four inches, they pulled it up 20 inches. The nuclear fuel went into an uncontrolled “excursion.” In less than a second the U-235 core melted, vaporized the water coolant, and the steam exploded. The whole containment vessel took off like a rocket, bounced off the overhead beams, and landed back on its foundation. Fired like a bullet from a gun, the control rod pierced the overhead and shot broken pieces all over the chamber. Another control rod shot up, pierced one technician from groin to shoulder, and pinned him to the ceiling. I can only hope death came quickly. Another man was scalded to death by steam and radiation on the spot. The third lived for about an hour. To this day, these three remain the only people killed by a nuclear accident in the United States. But the image sticks in my mind. Due to high radiation it took days for men working in one-minute shifts, to retrieve the bodies. They buried the victims in lead caskets encased in concrete. Except, I read, for “certain body parts,” which had to be treated as radioactive waste. The rest of the reactor structure was broken down piece-by-piece to the ground, and also treated as radioactive waste. They buried all the pieces in the basalt-strewn desert of the Snake River Plain. Needless to say, the Atomic Energy Commission reviewed procedures, and scrapped this design. The official attitue was, this was an “industrial accident,” and industrial accidents happen. I guess that’s true as far as it goes. With Japan’s Fukushima Daiichi accident we learned that in the immensity of time, there’s always one more unforeseen event. One more “industrial accident” waiting to happen. Wandering through the successful EBR-1 museum, though, it looked so happy and innocent. Those scientists so full of pride. The positive energy of cutting-edge research, hard work, and accomplishment. What’s more, despite the ghastliness of SL-1, or the financial and social carnage of Fukushima Daiichi, how does this stack up against hundreds of deaths each year, related to the coal-fired power industry? I don’t have answers to such questions. In fact I don’t think that’s even the right question. Is the energy source the real problem, or does the problem lie in the energy users? Does the onus lie on the people who sell us what we want, hot stoves, cool air conditioners, bright lights, laptops, flat-screen televisions? Or should it really lie on you and me, buying those things?